The ultimate all-rounder has been updated to meet the demands of today’s rider. 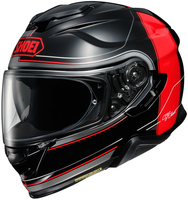 The shell design of the new Shoei GT-Air 2 has been evolved but remains true to its aerodynamic and stable roots. Featuring an improved ventilation scheme, the GT-Air II includes the lengthened QSV-2 drop down sun visor which provides 5mm more coverage for instant sun relief. Like its flip-up cousin, the Neotec 2, the GT Air 2 has a micro ratchet chin strap and is designed to integrate with the GT-Air II specific SRL 2 Bluetooth Communication System by Sena for a clean and low profile installation. Note: Due to manufacturer restrictions, Shoei products can only be shipped to addresses within the United States. $35 Promotional Gift Card available on this product!